I guess you could say cake auctions are a joy. Cake auctions with an amateur auctioneer in a sombrero preceded by a top–notch taco bar fundraiser with homemade donkey piñatas are pure delight. Jas and I decided to come packing some mega–heat for the cake auction... twenty dolla bill y'all. The bidding began. I had my eye on an authentic, gooey, made from scratch and passed down from generations family recipe of a German Chocolate cake (ok, not sure all those things are facts, but that's how downright delectable that baby looked). Jason had his eye on a nice, thickly frosted, tray of brownies. Then a lovely little number came up for auction. We were pretty sure we saw Chuck, one of our very favorite friends, carrying it when he walked in to the party with his wife, Mary Lynn (another very favorite friend), following close behind. Before the bidding our amateur auctioneer began to try to describe the lovely two–tiered item. "Here we have what looks like a chocolate cake with... strawberry frosting..."
"Nahh!" Chuck raised a hand in the air and elevated his voice to be heard over the ambient nose of children scurrying and people chatting in the church gymnasium. "It's cherry! and raspberry! and uh, and uh, rhubarb, and cream uh cream cheese buttercream frosting!" "So everything ever you wanted in a frosting, frosting on a two-tiered chocolate cake..."
"It's a chocolate, no dark chocolate cake from scratch." Jas and I looked at each other as if to simultaneously say "We're in!" "Alright who'll start the bidding at five dollars? five dollars five dollars, five dollars, Five dollars!" 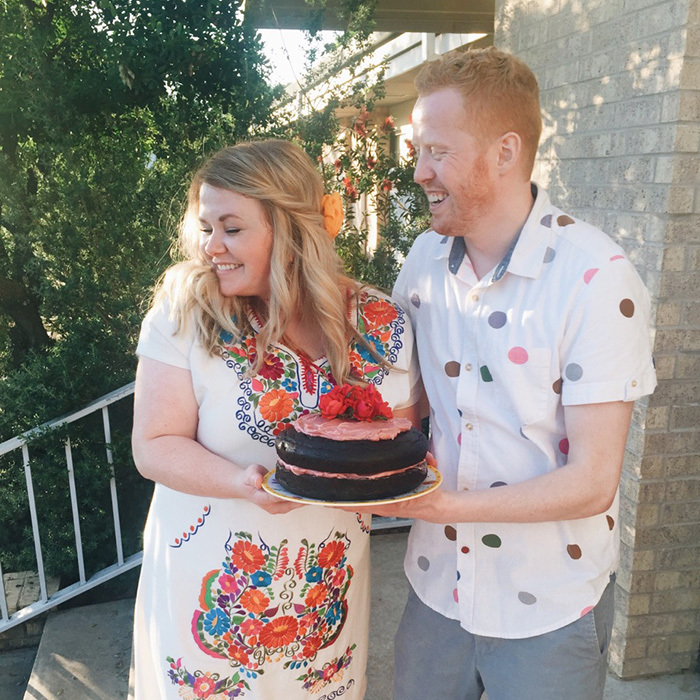 And before we knew it we were the proud owners of a $10 two tiered dark chocolate from scratch cake with cherry, raspberry, rhubarb, cream cheese buttercream frosting. As we were cleaning up and clearing out the event Mary Lynn passed by and we told her how excited we were to have won her cake. "Oh no." Her eyes were wide with smile. "That's Chuck's cake. He made it all by himself. Scoured recipes online and came up with it all on his own." You can imagine Jason and I's surprise and delight! "You're kidding! This is the best." She shook her head, "I really think we need to give you your money back..."
"What? We got a great deal!" "When he was working on it in the kitchen I could hear all sorts of moving and shuffling around in there... he kept yelling out questions for me. 'Is powdered sugar the same as real sugar?!' And then he did't remember to set a timer. I started to smell something and let out a yelp! He got it out of the oven and was trying to take it from the pan and THUNK it went onto the counter." I'm uncertain of the last time Jason and I were laughing so hard. Mary Lynn put her finger to the side of the cake, testing how hard it really was, grimacing. "Then we had to scrape off the frosting in the middle because he'd had big chunks of butter all through it..."
"Hey! I thought it would probably melt in there." Chuck had come up behind Jason and decided to stand behind his cake and all decisions in the making of it. "I believe I followed all the directions." "We got it all scraped off and blended it up and spread it back on... ... oh I hope it's alight. Edible at least. I really feel like we aught a have you over and repay you with dinner and another..."
"No repayment necessary!" Jason and I chorused each other. "Now we know the back story I'm sure we couldn't be happy with any other cake." "Well... I don't know about that." Mary Lynn sighed, her eyes flitting up to Chuck. "But the roses on top are right off Chuck's very own rose bush! And I washed out all the bugs." We figure we got the best deal of the whole Girl's Camp Fiesta Fundraiser & Cub Scout Cake Auction. A good story is always worth more than a perfectly crafted two tiered dark chocolate cake frosted with everything you ever wanted in your frosting, frosting (and yes, it really was everything you ever wanted in your frosting, frosting). I don't know about taste after that story, but that cake is definitely eye-candy! It looks so pretty!